*I also wanted to add that though this review will contains no spoilers for Pandemonium, THERE WILL BE SPOILERS FOR BOOK 1, Delirium. (If you haven't read Delirium, you can find my full review here). After I read Lauren Oliver's Delirium I was left fairly intrigued for the sequel. The third book in the trilogy, Requiem, is also due for release early March. I figured I should read Pandemonium before I forgot everything from Delirium. I picked it up as soon as the (cheaper) paperback copy became available earlier this month. "The old life is dead. But the old Lena, is dead too. behind a wall of smoke and flames. In this electrifying followup to her accalimed New York Times bestseller DELIRIUM, Lauren Oliver sets Lena on a dangerous course that hurtles through the unregulated Wilds and into the heart of a growing resistance movement. This riveting brilliant novel crackles with the fire of fierce defiance, forbidden romance, and the sparks of a revolution about to ignite." Society fears "love," which they believe is a disease, called deliria, and attempt to fix it with the mandatory "cure" at age 18. There exists the "Wilds," the land beyond the society where the Invalids (those who oppose the cure and escaped society) live. Lena (protagoinst) falls in love with a boy, Alex. There's a lot that goes on with her mom that I won't go into too much detail about. Basically, she thought her mother was dead, but discovers that her mother was imprisoned and escape, presumably into the Wilds. Lena decides she doesn't want to go through with the cure and plans to leave with Alex for the Wilds. On the day of their escape, they are discovered. Alex is captured allowing Lena to run. I think I got the overall idea across if you're forgotten any of the main points. It felt very, very short. I felt like what happened in the entire book should have only been half of the book. I found the first third of the book to be a bit slow, but at that one-third mark the pace really picked up and it was hard to put down. However, despite that, I didn't feel like much happened. I realize that's a strange thing to say for a novel that is nearly 400 pages, but compared to how many changes and events took place in book 1, book 2 felt incredibly, incredibly short. A new character, Raven, is introduced early on in the story. She was just okay to me. I really wanted to like her, but I couldn't really get myself to. I continued to like Lena for her running. Unfortunately, I am far more fascinated with the action in this series than I am for the well-being of the characters. Interesting, semi-thrilling sequel. 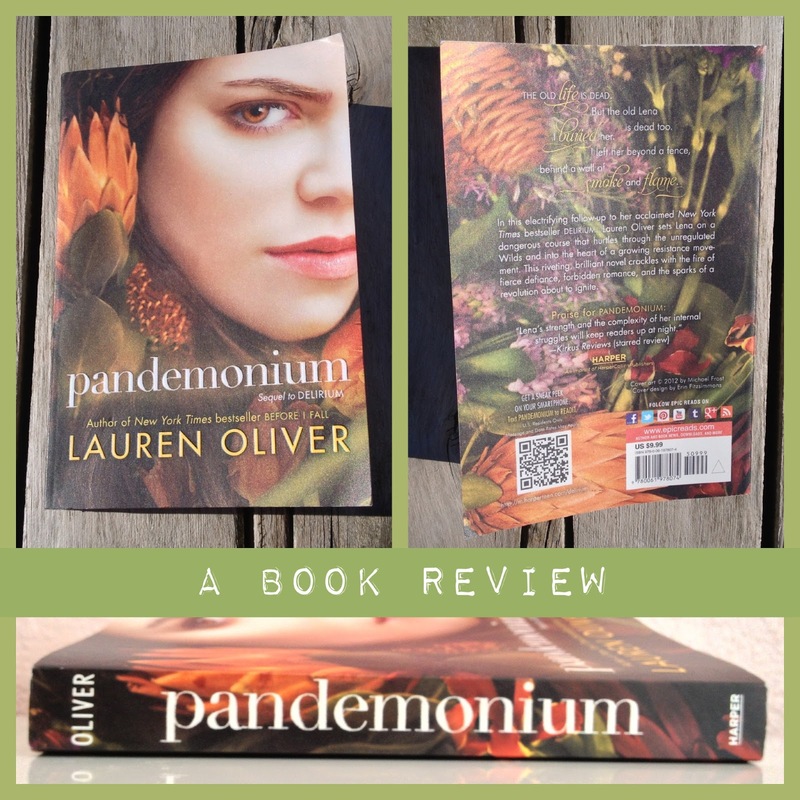 If you enjoyed Delirium you will probably enjoy Pandemonium as well. That was a fairly short review, but I hope you enjoyed it anyway. I have been avoiding writing book reviews for sequels since I find they are less helpful to the general public (and only useful to those who have read the previous book), but I felt like doing it anyway.